In order to celebrate the release of Sacha Baron Cohen‘s The Dictator on the On Demand Movie channel, we are giving away an awesome prize pack that will get you pumped up and ready to watch Admiral General Aladeen, Surpreme Leader for Life of the Democratic Republic of Wadiya on your TV! 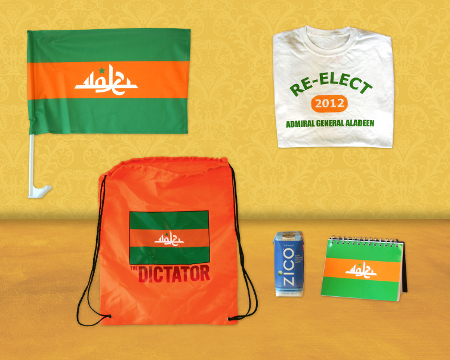 The awesome little prize pack includes a Wadiyan flag to wave continuously throughout the film, a Wadiyan notebook, a “Re-elect Aladeen 2012” t-shirt and, of course, coconut water to stay hydrated. All of these fun prizes come packed away in a fun, orange, eco-friendly tote bag. Now, how can you pass up an awesome tote bag? For more information about the Movies On Demand service, be sure to visit their Facebook Page. 1) Place your e-mail address in the comments section below along with your fave Sacha Baron Cohen movie. 2) Tweet your e-mail address to @celebdirtylaund along with your fave Sacha Baron Cohen movie. Deadline: The contest will run until Monday, September 3rd — make sure to enter SOON for your chance to win! There will be one winner who receives the prize. Eligibility: This contest is open to all USA residents. Prize: The ultimate Dictator prize pack. Disclaimer: Celeb Dirty Laundry has not received any payment or promotional products as a result of this giveaway. The prize pack has been provided by On Demand Movie; however, this company is not sponsoring nor are they administering this post. We just love giving away great treats to our stellar readers!